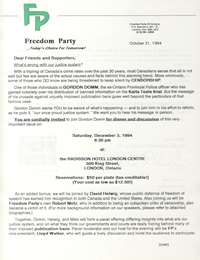 Two-page hardcopy letter from then FPO leader Jack Plant to members and supporters of Freedom Party of Ontario, inviting them to Freedom Party’s December 1994 dinner, featuring speeches by activist Gordon Domm and journalist David Helwig. Mailed to members and supporters via Canada Post. Enclosures include: promotional poster and a response form. Document Mailed-out: October 31, 1994.